Prior to the National Trust it was owned by the Harpur Crewe family. They seem to have been quite an eccentric family that loved collecting things. The house has only had minor restoration and is maintained in a similar state to when the National Trust took it over. As such it appears to be very much lived in, full of shabby chic furniture and as already mentioned masses of collections. One room particularly leaves a lasting impression. It’s stuffed full of precious stones, fossils and quite possibly hundreds of stuffed birds and animals. Although out of fashion these days there is a startling array and if you have kids with you they will either take great pleasure in the macabre nature of the stuffed beasts, or find them slightly eerie. A slight walk away from the house there’s a lovely walled garden – some parts of it are full of flowers, others fruit and veg. On our last visit they also had pens in this area of ewes that had recently lambed – very, very cute. As with the house, you feel like you’ve really stepped back in time and if you’re like us, you can imagine yourself in period dress tending the borders. Don’t miss the tunnels. The one we went down went from the house to the old brewery – they are amazing and a trip in one makes you feel like you’re in an ancient secret spy movie. They used to be used by the servants and it’s a real privilege to be able to follow in their footsteps. Calke’s also set in a lot of park land so if you like walking, take a good pair of shoes and a picnic and explore! 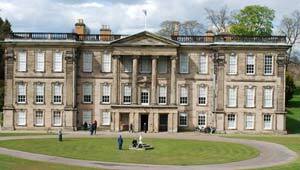 Calke Abbey is open only at weekends from 10am to 5pm (10am to 4pm in the winter months). The house is usually closed in January and early February. The parkland, restaurant, shop and gardens are open most days through the year. Adult admission for the whole property is £8.18 (2013 prices) with discounts for children, families and groups.